Due to creative differences, a director leaves a project. Another director steps in. This is a pretty regular occurrence in Hollywood. In 1984 this happened while filming a science-fiction film about two different species learning to put aside hate and embracing friendship. It’s a good concept for a science-fiction film. The new director was an established presence and had made a masterpiece just three years earlier. However, the film didn’t quite gel with audiences and was considered a huge box-office bomb, even to this day not breaking even. 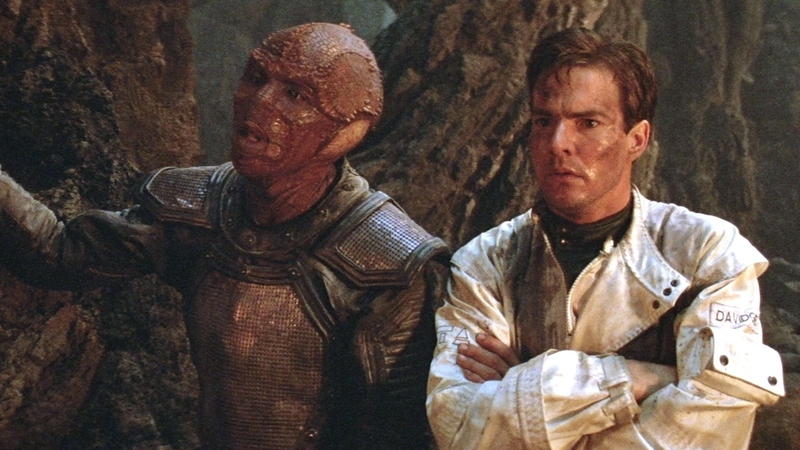 That film was Enemy Mine. 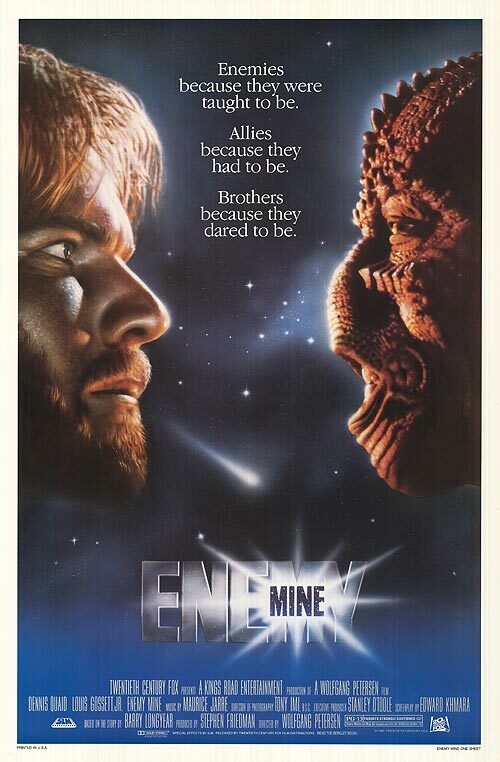 Human and alien face off against each other on the poster for Enemy Mine. Released in December 1985, Enemy Mine follows Earth pilot Willis Davidge (Dennis Quaid), who ends up stranded on a deserted planet after a battle with the human’s hated foes, the Dracs. Davidge finds out one of the Drac pilots survived a crash as well, and due to constant deus ex machina problems, these two bitter enemies never get around to killing each other. They instead realize they must band together if they’re going to survive living on this planet. It’s a pretty standard script, but it has some things going for it that make it stand out. Jerry and Davidge inspect Davidge’s building skills. The biggest win the film has is the casting of Louis Gossett Jr. as the alien Drac, Jerry. Gossett brings an expressiveness to the alien mask and dialogue that make him a unique character. While neither of the two main characters are perfect, their relationship develops naturally, taking two steps forward in empathy and then one step back during moments of crisis. It’s also a nice touch that they don’t just force the alien to learn English, but show Davidge also learning the Drac language. Another interesting thing that might play better now than it did in 1985 is that Dracs reproduce asexually. Jerry is neither male nor female. When you have an actor as commanding as Gossett, this isn’t used as a joke or punchline but as a natural order of things for Dracs. Louis Gossett Jr. is completely unrecognizable. Wolfgang Petersen is the director that stepped up to help the film. After his acclaimed Das Boot (which you should watch), he was able to spend a lot of time developing the world of The Neverending Story. With Enemy Mine, he was thrust into the director’s chair. He decided that the scenes the original director shot wouldn’t work, so filming took a brief hiatus before relocating the entire production to start shooting over again. Petersen was able to do a lot with very little wiggle room in scheduling. They rebuilt all sets and completely recreated the Drac makeup. If Petersen had had a more reasonable amount of lead time, the film might have turned out differently. For a modern antecedent picture like what happened to Peter Jackson on The Hobbit; forced to jump in at the last minute and run with the ball since the play was already in motion (I don’t know how I ended up with a sports analogy. Sorry about that). If the film hadn’t lost almost $20 million after the failed first attempt, it might have even made money. Davidge gets to show off his hair growth skills. While I overall enjoy the film, as does my 11-year-old self when I first saw it, it does have its problems. While a logical progression in plot, as Davidge learns that acceptance and understanding are important, the ending feels a little too “white saviory.” It makes sense to the story but does feel a little heavy handed. We get a great appearance from character actor Brion James (Replicant Leon from Blade Runner), so the ending gets a couple extra points from me for that. Also, Davidge is eventually rescued from the planet, and the camera lingers on one of his former squadron members and we’re almost led to believe there was a relationship there, but the last we saw of this character was over an hour ago, and she was onscreen for less time than it took me to write this sentence. There could very well be deleted scenes that add to this relationship, but we have to go by finished product, so that moment feels a little false. Kudos to ILM for their matte painting work. The space battle looks a little cheap (but no worse than some other films of the time), but the deserted world is perfectly bleak. Some of the creatures are fun and show just enough to pull you into the world, but as mentioned earlier, the standout is the Drac makeup. Setting it up as suitably alien but allowing for just the right amount of expression. I would recommend Enemy Mine for the story of friendship, ahead of it’s time gender thinking, and Louis Gossett Jr.’s portrayal of Jerry. It’s an appropriate B-movie space opera for all ages. I loved this movie when it came out. Didn’t know anything about the problems they faced (new director, etc.) so took it at face value. Great message about getting to know someone who is different than yourself. Highly recommend it.